Butterfly-bush is not easily confused with other wild plants on this web site. This is a perennial shrub which seems to grow just about anywhere – waste ground, embankments, even on the rooftops of old or derelict buildings and, of course, in the gardens of those wishing to encourage and admire Butterflies. It's a loose, lanky shrub which branches from ground level. From June to September it carries long, conical spikes of 4-lobed pinkish-mauve flowers (3-4mm across) which have a small orange 'eye' and which are heavily scented. Its lanceolate, opposite leaves are grey-green and the arching stems are light coloured, appearing somewhat cracked. This shrub can reach a height of 4 metres. It is not a native but an introduction from China and it belongs to the family Plantaginaceae. I first recorded this plant in Dalkey, Co Dublin in 1966 and photographed it in Gibletstown, Co Wexford (photo with Small Tortoiseshell) and Shanganagh, Co Dublin in 2006. 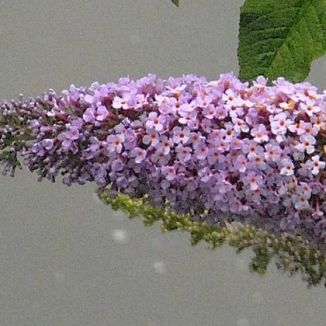 Buddleja was named after seventeenth century English rector and botanist, Rev Adam Buddle and this species was named after nineteenth century French Catholic priest, botanist and zoologist, Fr. Armand David who brought many plants from his missionary postings in China to the Jardin des Plantes in Paris. 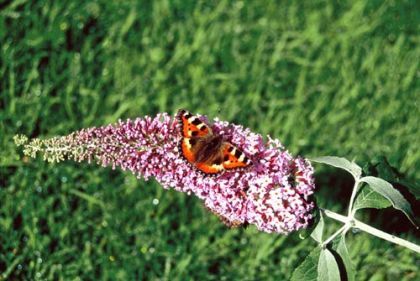 If you are interested in attracting Butterflies into your garden, this is the shrub to have. It only requires to be pruned hard in spring and should you want to grown it from a cutting, winter is the time to take hardwood cuttings from it.